Ponyo On The Cliff By The Sea is the latest film by master Japanese animator Hayao Miyazaki. 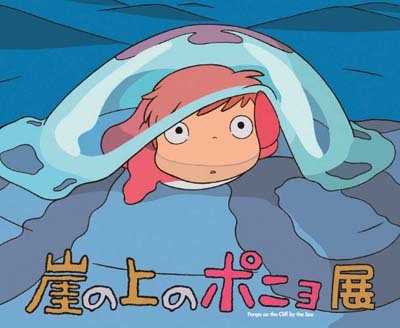 The title character (loosely based on The Little Mermaid) is a fish who longs to be human after falling in love with Sosuke, the boy who catches her. Miyazaki's films all appeal to both children and adults, and Ponyo is no exception, though (like his earlier My Neighbour Totoro) it's aimed at a younger audience than some of his more recent works. Miyazaki begins the film with a clear warning about marine pollution, depicting the sea and coastline littered with rubbish. Also notable is the portrayal of Sosuke's mother, Lisa; her frustration when she is late for work, and when her husband is late home, is surprisingly realistic, given the otherwise innocent nature of the film. As in many of Miyazaki's films, there are magical elements which are never fully explained. Ponyo's father, for example, is a kind of Captain Nemo figure, a wizard who lives underwater; her mother is a sea goddess. At the end of the film, the wizard appears to rejuvenate a group of elderly people in a magical water-bubble, in an odd and surely unintentional echo of the film Cocoon. Thank you for your information. It is interesting to watch. I will watch it if there is a chance. I would have loved to watch this with you. Saw the trailer on the apple site. :P Please take care..